chapter outlines one of the text's strongest arguments: the selection and funding of non-public ...... UniÃ³n Europea. Valencia: Tirant lo. Blanch, 2007. 482 pages. 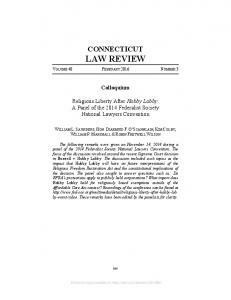 Common Market Law Review 49: 401–416, 2012. 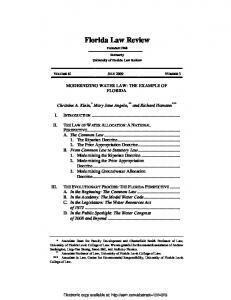 © 2012 Kluwer Law International. Printed in the United Kingdom. Case C-81/09, Idrima Tipou AE v. Ipourgos Tipou kai Meson Mazikis Enimerosis, Judgment of the Court of Justice (Second Chamber) of 21 October 2010, not yet reported. In this case, the Court was called to examine the concept of “limited liability” in EU company law and to say whether penalties imposed on shareholders of public limited companies operating television stations have a deterrent effect on investors from other Member States.1 The significance of this ruling lies in the interpretation of the First Company Law Directive2 and more specifically the notion of limited liability. The Court was called to examine whether EU company law has a sufficiently definite concept of the legal form of public limited company, which, like the legal orders of many Member States, recognizes a principle that the liability of a company with share capital is limited to the corporate assets.3 Another important aspect of this ruling is the examination of the national legislation under freedom of establishment and free movement of capital. Some useful conclusions are extracted out of this examination. 1. Another case brought before the Court and related to the Greek rules on shareholdings in the media sector was Michaniki, where the Court stated that EU law must be interpreted as precluding a national provision which, whilst pursuing the legitimate objectives of equal treatment of tenderers and of transparency in procedures for the award of public contracts, establishes an irrebuttable presumption that the status of owner, partner, main shareholder or management executive of an undertaking active in the media sector is incompatible with that of owner, partner, main shareholder or management executive of an undertaking which contracts with the State or a legal person in the public sector in the broad sense to perform a works, supply or services contract: Case C-213/07, Michaniki AE v. Ethniko Symvoulio Radiotileorasis and Ypourgos Epikrateias,  ECR I-9999. For comments, see Kosta, case note on Michaniki, (2009) EuConst, 501–516; McGowan “Exclusion of bidders on grounds of holding media interests: Michaniki AE v. Ethniko Simvoulio Radiotileorasis and Ipourgos Epikratias (C-213/07)”, (2009) Public Procurement Law Review, 79–82. 2. First Council Directive 68/151/EEC of 9 March 1968 on co-ordination of safeguards which, for the protection of the interests of members and others, are required by Member States of companies within the meaning of the second paragraph of Article 58 of the Treaty, with a view to making such safeguards equivalent throughout the Community, O.J. 1968, L 65/8. 3. Opinion of A.G. Trstenjak, para 3. This reference for a preliminary ruling was made in proceedings between Idrima Tipou AE, a limited company whose registered office is in Greece, and the Greek Minister for the Press and Mass Media, concerning a fine imposed for infringement of the legislation and rules of good conduct governing the operation of television stations. Idrima Tipou is a public limited company with a shareholding in Nea Tileorasi AE, the owner of the television station Star Channel. It challenged, before the Simvoulio tis Epikratias, a Decision of the Minister imposing a fine of GDR 10,000,000 (approximately EUR 29,347) jointly and severally upon it together with Nea Tileorasi AE and the other shareholders and the members of the board of directors of Nea Tileorasi AE on the ground that, during a news programme on Star Channel it infringed the obligation to respect the character, honour, reputation, family life and presumption of innocence of various personalities.4 Greek Law No 2328/1995 defines the legal regime governing private television and local radio, and regulates inter alia the grant of licences to found, establish and operate private television stations, and shareholdings in public limited companies which apply for such a licence. Various provisions of the Law have the aim of limiting to 25 percent the maximum percentage of the share capital that a natural or legal person can hold in a company which has a licence to found, establish and operate a television station. In addition, any transfer of shareholdings exceeding 2.5 percent of the share capital must be notified to the relevant national authorities.5 Article 3 of the Law provides: “1. (b) Broadcasts of any kind (including advertisements) which are transmitted by radio and television stations must respect the character, honour, reputation, private and family life and professional, social, scientific, artistic, political or other similar activity of every person whose image appears on the screen or whose name, or information sufficient to identify him, is broadcast.” 6 Moreover, Article 4 provides: “1. In every case of infringement (a) of the provisions of national legislation, [of legislation] of the European Union and of international law which govern, directly or indirectly, private television stations and, more generally, the operation of private television, (b)…, (c) of the rules of good conduct as determined in accordance with Article 3 of this Law, the following penalties shall be imposed…: (a) recommendations and warnings, (b) a fine of GDR 5 million to GDR 500 million…,”. According to Article 4(3) on the imposition of fines, “the fines provided for in the preceding paragraphs shall be imposed jointly and severally on the company and 4. Judgment, paras. 2, 13, 14. 5. Judgment. paras. 8–9. 6. Judgment. para 10.
personally on its legal representative or representatives, on all the members of its board of directors and on all its shareholders with a holding of over 2.5 percent”.7 The referring court raised the question of the compatibility of Article 4(3) of the Greek Law with the various EU directives relating to companies,8 and referred a question to the Court for a preliminary ruling. It asked if the First Company Law Directive prohibited the adoption of a national provision such as Article 4(3) of Law No 2328/1995, insofar as it specifies that fines are imposed jointly and severally, not only on the company which holds the licence to found and operate the television station but also on all shareholders with a holding of over 2.5 percent. 3. Advocate General Trstenjak focused on whether there is a sufficiently definite concept of the legal form of public limited company and, as a matter of fact, whether there is a principle that the liability of a company with share capital is limited to the corporate assets. The Advocate General thought that this point was crucial, as it would determine under what conditions the corporate veil could be “pierced” and whether such “piercing” of the corporate veil is compatible with EU law.9 After a careful examination of the provisions of the first Company Law Directive, the Advocate General found that the national provisions in question did not breach the Directive. Additionally, Advocate General Trstenjak discussed thoroughly the possibility of a teleological delimitation of the prohibition on restrictions. More specifically, she examined whether a dogmatic delimitation of the notion of restriction in the field of freedom of establishment and free movement of capital would be reasonable.10 The Advocate General discussed the possibility of narrowing the scope of freedom of establishment and of free movement of capital, in accordance with the Keck11 approach. While the Advocate General proposed this stricter interpretation of freedom of establishment and free movement of capital, in the end she followed the regular approach of Court and admitted that, in principle, a broad understanding must be assumed.12 After suggesting that the national measures in question breached both fundamental freedoms, the Advocate General 7. Judgment, para 12. 8. Judgment, para 21. 9. Opinion of A.G. Trstenjak, para 3. 10. Opinion of A.G. Trstenjak, para 7. 11. Joined Cases C-267 & 268/91, Keck and Mithouard,  ECR I-6097. 12. Opinion of A.G. Trstenjak, paras. 78, 118.
discussed the possibility of justification. Her justification analysis was based on an extensive discussion of the proportionality test, focusing on appropriateness, necessity and reasonableness. Fundamental rights considerations were also included. Advocate General Trstenjak concluded that the national measures in question were not justified, because they could not be regarded as proportionate. Therefore, the freedom of establishment and the free movement of capital preclude the abovementioned national provisions. 4. The question put by the referring court concerned the interpretation of the First Company Law Directive; the Court applied the freedom of establishment and free movement of capital.13 The national provision in question was found to be compatible with the First Company Law Directive. The Court concluded that the Directive did not impose a rule that a shareholder can never be liable for a fine imposed on a company, including where the fine is imposed jointly and severally on a public limited company and on the shareholder.14 The Court scrutinized the Directive and stipulated that it did not prescribe a uniform concept of companies limited by shares or otherwise having limited liability based on such a principle. More specifically, the Court referred to Article 1 of the First Company Law Directive which lists for each Member State, the different types of company under the law of that Member State to which the Directive’s rules apply.15 The Court found that the Directive has no common definition of a company limited by shares or otherwise having limited liability; it only has rules which must be applied to certain types of companies identified by the European legislature as companies limited by shares or otherwise having limited liability.16 The Court stated that neither the wording nor the interpretation of the First Company Law Directive in the light of its aim or of the law of the Member States could reveal a common concept of “limited liability” at EU level.17 After finding the Greek law compatible with the First Company Law Directive, the Court went on to examine it in the light of the fundamental freedoms. The Court examined the effects of the Greek legislation on shareholders’ power and possibility of exercising control and finds that both fundamental freedoms must apply. More specifically, the Greek legislation 13. 14. 15. 16. 17. Judgment, paras. 30, 31–32. Judgment, para 44. Judgment, para 40 Judgment, para 41 Judgment, para 44.
limits to 25 percent the maximum holding that a natural or legal person can have in the share capital of a company which holds a licence to found, establish and operate a television station. Also, Article 4(3) of Law No 2328/1995 provides that a fine may be imposed on a shareholder once he holds more than 2.5 percent of the shares in such a company.18 Depending on the manner in which the remainder of a company’s capital is distributed, in particular if it is spread among a large number of shareholders, a holding of 25 percent may be sufficient to have control of a company or at least to exert a definite influence on the company’s decisions and determine its activities.19 The Greek legislation can therefore fall within the scope of Article 49 TFEU. In addition, inasmuch as that legislation applies to shareholders whose holding exceeds 2.5 percent but is not sufficient to allow them to control or exert a definite influence on the company’s decisions, it can also fall within the scope of Article 63 TFEU. Hence, both those provisions must be interpreted.20 After ascertaining that both fundamental freedoms apply, the Court analysed the possible restrictions21 on the exercise of these freedoms. The Court stated that the national measure at issue (liability for fines) has a deterrent effect on investors and thereby affects their access to the equity market.22 The powers that shareholders of a public limited company in the television sector possess, in accordance with Greek company law, do not allow them to ensure that the company observes Greek legislation and rules of good conduct. The Court noted that the national provisions in question were indistinctly applicable to Greek investors and investors from other Member States, but its deterrent effect was greater for investors from other Member States than for Greek investors. The Court concluded that the national measure in question restricted the freedom of establishment and the free movement of capital.23 The Court did not accept the proposed justifications and concluded that the national legislation in question breached both fundamental freedoms. Judgment, para 50 Case C-326/07, Commission v. Italy,  ECR-I-2291, para 38. Judgment, paras. 51–53. Case-C-518/06, Commission v. Italy,  ECR-I-3491, para 62. Judgment, para 56. Judgment, para 57, 58, 60. The First Company Law Directive lists the classic range of companies limited by shares. This Directive refers to the parallel forms of the public limited company (PLC), the private limited company, and the partnership limited by shares. Nevertheless, these forms do not all exist in all company laws of the Member States.24 The notion of “limited liability” in company law is related to the imposition of a default term in contracts between a firm and its creditors, whereby creditors can only claim assets that are held in the name of the company itself and cannot claim assets that are held in the name of the company’s shareholders.25 Limited liability is considered to be essential for non-entrepreneurial investments; otherwise, shareholders not intending to engage in the operation of the business would not find capital investments attractive. If these investors had to be anxious about their other assets and had to follow more closely the business of the company they invested in, the gathering of capital for these investments would be very difficult.26 The First Company Law Directive did not establish a rule that a shareholder can never be liable for a fine imposed on a company and did not give a common definition of “limited liability” for EU corporations. Nor did it list the essential characteristics that a “limited liability” company operating within the internal market should possess. The European legislature simply 24. Grundmann, European Company Law: Organization, Finance and Capital Markets (Intersentia, 2007), 9. 25. Kraakman et al., The Anatomy of Corporate Law, 2nd ed. (OUP, 2009), p. 9. The liability of companies in tort is also relevant here. Vicarious liability is an important principle of tort law. The company as a wrongdoer is always liable for its own wrong but others (directors or senior officers) may be jointly or severally liable with the wrongdoer. In certain relationships, the principle of vicarious liability makes a party (company) who has not done the wrong responsible and liable by virtue of its relationship with the wrongdoer (directors or senior officers). 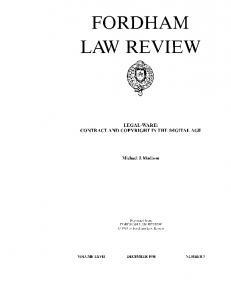 Hannigan, Company Law, 2nd ed. (OUP, 2009); Gower and Davies’ Principles of Modern Company Law, 8th ed. 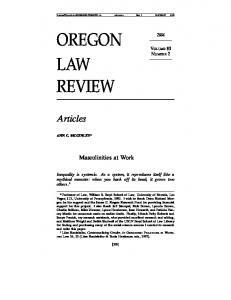 (Sweet & Maxwell, 2008); Laski, “Basis of Vicarious Liability”, (1916) Yale LJ 105; Woodley, Notes on Company Law (Hertfordshire 2010). 26. Grundmann, op. cit. supra note 24, p. 173; Halpern, Trebilcock, Turnbull, “An economic analysis of limited liability in corporation law”, (1980) U.Tor.L.J., 117. Yet liability has never been absolutely limited. Courts occasionally allow creditors to “pierce the corporate veil”, which means that shareholders must satisfy creditors’ claims. 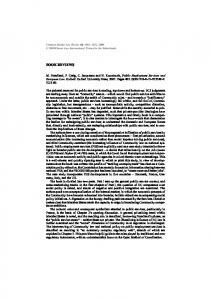 Easterbrook, Fischel, “Limited liability and the corporation”, (1985) UChiL.Rev., 89. 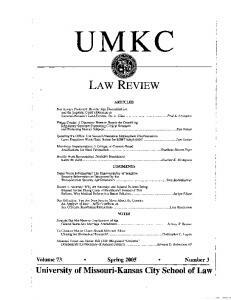 See also: Bahls “Application of corporate common law doctrines to limited liability companies”, (1994) MontLRev., 43. Fortney “Seeking shelter in the minefield of unintended consequences; The traps of limited liability law firms”, (1997) Wash&LeeLRev., 717.
enumerated certain types of companies enjoying limited liability and did not intend to establish a uniform concept of companies with limited liability.27 This list of different types of companies is open to amendment, in case of legislative changes of national company laws: new types of companies might be added, or existing types of companies might be omitted after possible amendments of national company laws. This amendment took place in Directive 2003/58/EC.28 The amendment of the First Company Law Directive was proposed because the list of companies covered by First Company law Directive had to be updated to take account of the new types of companies created or types of companies abolished at national level since the adoption of that Directive.29 The European legislature referred to specific types of national companies30 to be included or excluded from the scope of the directive and did not adopt a common definition of “limited liability” at EU level. The European legislature preferred not to adopt a sophisticated common definition for “limited liability”. In the hypothetical case that the European legislature had provided a common definition of “limited liability”, the Court would have been able to give that notion a uniform interpretation under EU law. Now, the Court is prevented from giving a uniform definition and interpretation.31 The Court can only interpret various aspects of the national regulations on “limited liability” and of the national corporate entities enjoying limited liability. The absence of a substantive definition in secondary EU law of the notion of “limited liability” means that the Court could not infer one. 27. It was argued that “limited liability” constitutes an unwritten principle of European company law. Grundmann, op. cit. supra note 24, p. 172. 28. Directive 2003/58/EC of the European Parliament and of the Council of 15 July 2003 amending Council Directive 68/151/EEC, as regards disclosure requirements in respect of certain types of companies, O.J. 2003, L 221. 29. The European Economic and Social Committee, in its Opinion on the Proposal for Directive 2003/58/EC, did not discuss the issue of a common definition of “limited liability”. It only referred to the common feature of “limited liability” that these companies share (para 1.1 “companies whose principal feature is the limited liability of members – i.e. companies limited by share capital”). 30. Directive 2003/58/EC updates the types of companies to which the First Company Law Directive applies, by adding those types of companies which have been introduced at national level since the adoption of the First Company Law Directive (the “société par actions simplifiée” in France, and the “besloten vennootschap met beperkte aansprakelijkheid” in the Netherlands) or after the accession of the Member State (the “anpartsselskab” in Denmark). 31. Opinion of A.G. Trstenjak, para 45. This lack of a common binding definition of “limited liability” allows national legal orders to structure the definition in accordance with their company law traditions. A common definition of “limited liability” would create implementation and adjustment problems due to the national divergences in this area of company law. Moreover, the Court denied that the principle of “limited liability” constituted a general principle of company law applicable in all circumstances and without exception. With regard to the “piercing the corporate veil” doctrine, this decision has no significant implications on the national company laws adopting this doctrine. “Piercing the corporate veil” means the judicially imposed exception to the separate legal entity principle, whereby courts disregard the separateness of the corporation and hold a shareholder responsible for the actions of the corporation, as if they were the actions of the shareholder.32 The First Company Law Directive does not contain a provision adopting the “piercing the corporate veil” doctrine. In other words, there is no provision which extends the liability to shareholders of public limited companies. Therefore, in the absence of harmonization, each Member State has the right to adopt and to structure the “piercing the corporate veil” doctrine, in accordance with its own standards.33 This decision affirms the national competence regarding the adoption of the “piercing the corporate veil” doctrine. 5.2. The Court concludes that the Greek legislation could fall within the scope of Article 49 TFEU,34 but did so without discussing in detail why this specific percentage of 25 percent which was chosen by the Greek legislature is deemed to be sufficient to have control of a company. The Court speculates on sufficient control of a company without a concrete analysis of Greek company law. The Court should have examined the Greek legislation more carefully, and especially Law 3461/2006 which implements Directive 2004/25/EC on takeover bids.35 According to Article 7 of Law 3461/2006, the sufficient percentage conferring control of a company is 1/3 (33.3 %) of a company’s capital. The Court did not scrutinize the existence of these two different control thresholds enacted by the Greek legislature. 36 With regard to the justification of a restriction on freedom of establishment, the Court accepted that the aim pursued by the Greek legislation (the right to 32. Salomon v. Salomon & Co  AC 22 (Salomon). Ramsay, Noakes, “Piercing the Corporate Veil in Australia”, (2001) CompSecLJ 250; Berle, “The Theory of Enterprise Entity”, (1947) ColLR, 343; Machen, “Corporate Personality”, (1910) HLR, 253; Cohn and Simitis, “Lifting the Veil in the Company Laws of the European Continent”, (1963) ICLQ, 189. Vandekerckhove, Piercing the Corporate Veil (Kluwer, 2007); Huss “Revamping veil piercing for all limited liability entities: Forcing the common law doctrine into the statutory are” (2002) UCinLRev 95. 33. OpinionofA.G.Trstenjak, para 55–57. 34. Judgment, para51 35. 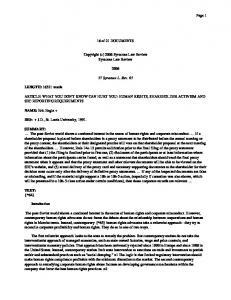 Law 3461/2006 (Gov. Gaz. 106/30.5.2006) “Transposition of the Directive 2004/25/EC on takeover bids”. 36. See also Lazarides and Drimpetas, “Evaluating corporate governance and identifying its formulating factors: the case of Greece”, (2011) CorpGov., 136–148. 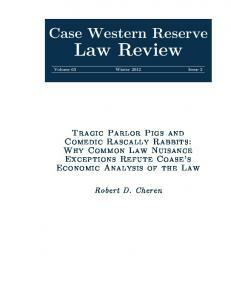 The Court applied a discrimination analysis where the notion of restriction was interpreted widely. 43 It would be interesting to see, here, whether the Keck approach could apply. 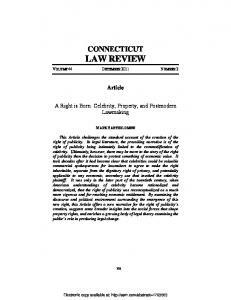 It has been argued that a common approach to defining a trade barrier across all the freedoms should be followed.44 This common approach would require restraining also the freedom of establishment and the free movement of capital, in a way similar to that followed in the limitation of the free movement of goods (Keck).45 The Keck limitation examines whether the national legislation constitutes a market access provision or a “selling arrangement” applying locally. An application of the Keck formula to freedom of establishment and free movement of capital would assist in identifying which indistinctly applicable measures have an adverse effect on cross-border (direct or portfolio) investments in practice. Moreover, transfer of the Keck formula to these two fundamental freedoms would recognize and protect an existing reality, the wide range of Member States’ provisions derogating from “limited liability”.46 Advocate General Trstenjak discussed this possibility of limiting the scope of freedom of establishment and free movement of capital.47 If a pragmatic analysis of the Greek provisions in question is followed, the practical consequences of the Greek provision constitute “conditions applying locally” which do not infer with market access. Cases C-282 & 283/04, Commission v. Netherlands,  ECR I-9141; Case C-112/05, Commission v. Germany (Volkswagen),  ECR I-8995. In all these cases, the Court ruled that not only discriminatory conduct on grounds of nationality constitutes a restriction, but every national measure that may possibly impede an investment or dissuade an investor from investing. 43. Judgment, paras. 54–59. 44. Opinion of A.G. Poiares Maduro in Joined Cases C-158 & 159/04, Alfa Vita Vassilopoulos AE, formerly Trofo Super-Markets AE and Carrefour Marinopoulos AE v. Elliniko Dimosio, Nomarchiaki Aftodioikisi Ioanninon,  ECR-I-8135). There are many papers examining the possibility of convergence: see e.g. Spaventa “From Gebhard to Carpenter: Towards a (non-)economic European Constitution”, 41 CML Rev. (2004), 743; Oliver and Roth “The internal market and the four freedoms”, 41 CML Rev., 407; Snell “And then there were two: Products and Citizens in Community Law”, Ch.4 in Tridimas and Nebbia (Eds), EU Law for the 21st Century, (Hart Publishing, Oxford 2005); Meulman and de Waele, “A retreat from Säger: Servicing or fine-tuning the application of Article 49 EC”, 33 LIEI (2006), 207; Hansen “Full circle: Is there any difference between the freedom of establishment and the freedom to provide services”, in Andenas and Roth (Eds. ), Services and Free Movement in EU Law (OUP, 2002), p. 197; Poiares Maduro, “Harmony and dissonance in free movement”, 4 CYELS (2001), 315; O’Keeffe and Bavasso, “Four freedoms, one market and national competence: In search of a dividing line”, in O’Keeffe (Ed. ), Judicial Review in European Union Law (Kluwer, 2000), p. 541. 45. 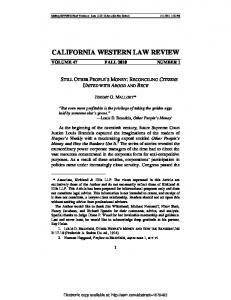 Keck and Mithouard, cited supra note 11. See also Hindelang, The Free Movement of Capital and Foreign Direct Investment (OUP, 2009) p. 116. 46. Emch, op. cit. supra note 41, 512. 47. Opinion of A.G. Trstenjak, para 74–79, 116–119. The way the Court delineates freedom of establishment and free movement of capital from each other is not really convincing.53 It seems that the Court has not decided yet whether freedom of establishment and free movement of capital apply equally or one of them takes priority. In some cases, on the acquisition of shares, as soon as the Court identified an infringement of the freedom of establishment, it declared that it was unnecessary to examine whether the provisions on free movement of capital precluded the legislation in question.54 In other cases, since an infringement of the free movement of capital was found, there was “no need” to examine the compatibility with the freedom of establishment.55The “golden shares”56 cases also belong to this strand of case law. In these cases, the Court stated again that since an infringement of the free movement of capital was established, there was no need to examine the national provisions separately under the freedom of establishment. It could be argued that “there is no need” means, in all these cases where the examination of one fundamental freedom was omitted in case of infringement of the other, that it was not necessary to spend time to examine the national provision in the light of another fundamental freedom, when it does not alter the result.57 In our case, both fundamental freedoms are placed on an equal footing because the Court proceeds to an examination of the free movement of capital, movement of capital and the other fundamental freedoms in third-country relationships, see Smit and Kiekebeld, op. cit. previous note, p. 39. 53. It could be alleged that Arts. 49(2) and 65(2) TFEU do not concern the scope of application of these two fundamental freedoms. They are related to grounds of justification. As a matter of fact, they do not result in recognizing primacy of one freedom over the other on the level of the scope of application: Hindelang, op. cit. supra note 45, p. 337. 54. E.g. Case C-200/98, X AB and Y AB v. Riksskatteverket,  ECR I-8261, para 30. Joined cases C-397 & 410/98, Metallgesellschaft Ltd and Others, ECR I-1727, para 27; Case C-251/98, Baars,  ECR I-2787. 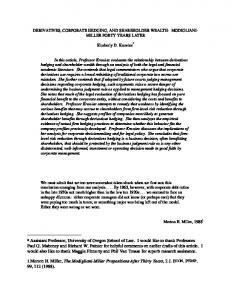 See further Flynn “Coming of age: The free movement of capital case law 1993–2002″, 39 CML Rev. (2002), 773, 790; Usher “The evolution of the free movement of capital”, (2008) Fordham IntLJ, 1533, 1545. In these cases, the Court might have chosen to apply free movement of capital because the national measures in question specifically and particularly aimed at governing capital movements. 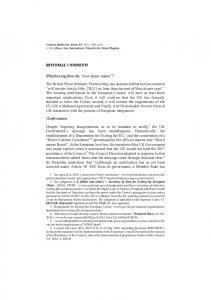 Ehricke, case note on Case C-174/04, Commission v. Italy, 43 CML Rev. (2006), 1457, 1464. 55. Case C-302/97, Konle,  ECR 3099. Landsmeer, “Movement of capital and other freedoms”, (2001) LIEI, 57, 64. 56. Case C-58/99, Commission v. Italy,  ECR I-3811, Case C-367/98, Commission v. Portugal,  ECR I-4731, Case C-483/99, Commission v. France,  ECR I-4781, Case C-503/99, Commission v. Belgium,  ECR I-4809, Case C-463/00, Commission v. Spain,  ECR I-4581, Case 98/01, Commission v. UK,  ECR I-4641, Case C-174/04, Commission v. Italy,  ECR I-4933, Joined Cases C-282 & 283/04, Commission v. Netherlands,  ECR I-9141, Case C-112/05, Commission v. Germany,  ECR I-8995. O’Grady-Putek “Limited but not lost: A comment on the ECJ’s golden share decisions”, (2004) Fordham LRev., 2220; Artes “Advancing harmonization: Should the ECJ apply golden shares’ standards to national company law?”, (2009) EBLR, 464. 57. Hindelang op. cit. supra note 45, pp. 92, 94.
even though it had established an infringement of the freedom of establishment. This examination in the light of both fundamental freedoms also agrees with the Commission’s approach; the Commission suggested that, at least as far as the influence of certain provisions on direct investments are concerned, the free movement of capital and establishment provisions apply in parallel.58 However, if one compares this approach with cases where the Court decided not to examine compatibility with free movement of capital in case of a prior identification of a breach of freedom of establishment, the inconsistent judicial approach is pretty obvious. 5.3. The Greek legislation equates shareholders possessing a holding of more than 2.5 percent who are journalists and shareholders possessing a holding of more than 2.5 percent who are not journalists. This equation is arbitrary and does not contribute at all to the legislative aims proclaimed by the Greek government. The Greek Government stated that, at the time Law No 2328/1995 was adopted, numerous journalists were shareholders holding more than 2.5 percent, and that the objective of that Law was, first, to fragment the capital of television companies in order to prevent a single shareholder having too much power and, second, to encourage the shareholders to come together to adopt decisions relating to programmes.59 The aim of the Greek legislation is a legitimate one, but the means of achieving this aim are not the right ones. The Greek legislation should be addressed to those shareholders who are also journalists and should not affect shareholders who do not exercise this profession. However, this is not the case in this specific Greek Law. Moreover, there must be a further examination within the class of shareholders possessing a holding of more than 2.5 percent who are journalists. These shareholders should not be held liable automatically. Their personal liability for the infringement of the Greek legislation on the right to respect for private life should be examined. There might be shareholders possessing a holding of more than 2.5 percent, who are journalists but who were not involved in this specific infringement. This latter ascertainment requires the examination of the problematic linking factor chosen by the Greek legislature. The factor adopted by the Greek legislature is the capacity of shareholder possessing a holding of more 58. European Commission “Special rights in privatized companies in the enlarged Union-a decade full of developments” Staff working document, 22 July 2005. Handoll, Capital, payments and money laundering in the EU (Richmond, 2007), p. 37–38. 59. Judgment, para 64.
than 2.5 percent. This arbitrary equation shows that the factor chosen by the Greek legislature for the joint and several imposition of the fine infringes the principle of proportionality. The appropriate factor to be adopted by the Greek legislature should be based on the capacity of journalist and not on the generic capacity of shareholder. The Court did not examine the degree of control that a shareholder possessing more than 2.5 percent of the capital has on the everyday business of the company. The Greek legislation simply assumes that a shareholder possessing more than 2.5 percent of the capital could influence, alone or together with other shareholders, the business of the station and, therefore, is responsible for any infringement of legislation and rules of good conduct governing the operation of television stations. The imposition of penalties is based on shareholding and not on the liability for breach of media regulations.60 The Court did not examine the fact that the influence and the subsequent responsibility of this category of shareholders are considered to be self-evident and automatic by the Greek legislation. The Greek legislature did not provide any evidence in order to justify this self-evident and automatic influence and subsequent responsibility on behalf of shareholders possessing more that 2.5 percent of the capital. However, Advocate General Trstenjak argued that the national court must examine whether this influence and the subsequent responsibility were purely theoretical. The individual shareholder is at the end of a long chain of decision-makers whose behaviour can influence only to a limited extent. Nor can he predict whether one of the television station’s staff, whether intentionally or negligently, will infringe the legislation and rules of good conduct governing the operation of television stations. These considerations reveal that the actual influence of a shareholder on the internal processes of a television station could not be deduced from the influence which the shareholder exercise within a company.61 Apart from shareholders with a holding of over 2.5 percent, Article 4 of Law No 2328/1995 provides that the administrative fines were also imposed on all the members of its board of directors. The Court was not asked to examine the position of the members of the board of directors in the light of the freedom of establishment and did not proceed to this analysis. However, a parent company established in one Member State, which allocates a few members of its staff to managerial or supervisory posts in a subsidiary established in another Member State is protected by the freedom of establishment. This transfer of managerial staff from parent company to subsidiary falls within the scope of the exercise of the freedom of establishment by the parent company. The 60. The Greek legislation contains other possible penalties that could be imposed in respect of television operations and not the mere holding of share capital (e.g. ethical penalties). 61. Opinion of A.G. Trstenjak, para 93.
freedom of establishment includes the establishment of the subsidiary, as well as, the exercise of the managerial and administrative control over this subsidiary. Article 50(2)(f) TFEU states that “the Council and the Commission shall carry out the duties devolving upon them under the preceding provisions, in particular… by effecting the progressive abolition of restrictions on freedom of establishment in every branch of activity under consideration… as regards the conditions governing the entry of personnel belonging to the main establishment into managerial or supervisory posts in such agencies, branches or subsidiaries.” It could be argued that the Greek Law in question could dissuade a parent company established abroad from establishing a subsidiary in Greece and from transferring some members of its staff into managerial or supervisory positions (such as members of the board of directors) in its subsidiary. Hence, it could be argued that the potential liability and the imposition of this administrative fine jointly and severally on all the members of the board of directors might discourage companies of other Member States from establishing a subsidiary in Greece.62 6. The Court confirmed its stance towards some matters, like the restrictions of freedom of establishment and the free movement of capital. However, some matters, like the concurrent application of the free movement of capital and of the freedom of establishment, were not explained and remain obscure. The most important part of this ruling is probably the discussion of the notion of “limited liability” and its relationship with the harmonization of company law in EU. The analysis of this aspect of the First Company Law Directive affirms the tendency in the regulation of EU company law as part of the internal market to favour harmonization rather than unification.63 While the Court found that the national legislation did not breach the relevant provisions of the First Company Law Directive, it declared that the national legislation infringed the Union fundamental freedoms. The Court preferred to rely on the fundamental freedoms in order to establish an infringement of EU law rather than adopting a lato sensu interpretation of the provisions of the First Company Law Directive. The Court interpreted “limited liability” in accordance with the legislative aims of the First 62. Wyatt, “Horizontal effect of fundamental freedoms and the right to equality after Viking and Mangold, and the implications for Community competence”, (2008) Croatian Yearbook of European Law and Policy, 1, 42. Case 79/85, Segers,  ECR 2375 para 15. See also Opinion of A.G. Trstenjak, para 72. 63. E.g. see the SE Statute. Council Regulation (EC) No 2157/2001 of 8 Oct. 2001 on the Statute for a European company (SE), O.J. 2001, L 294/1. 64. Reliance on national types of companies enjoying limited liability. 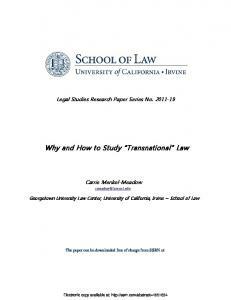 * LLB (Thessaloniki), MJur (Oxford), MPhil (Oxford), DPhil (Oxford)- Department of Law, School of Humanities and Social Sciences, European University Cyprus and Thessaloniki Bar. I would like to thank the anonymous referees of this journal for the very helpful comments on an earlier draft of this case note. The usual disclaimer applies. 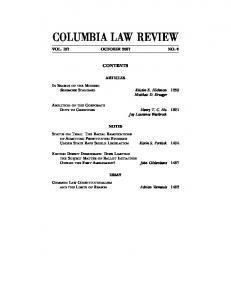 Report "Common Market Law Review - SSRN papers"